Powerbolt innovated the keyless entry technology over 10 years ago and has stood up to the test of time. Simply enter your personalized access code for convenient keyless entry. Powerbolt is easy to install, program and use. And the motorized driven deadbolt allows for one-touch locking. It operates on 4 AA batteries and features SmartKey re-key technology as the back-up keyway. This single cylinder deadbolt can be locked or unlocked by using the keypad or key from the outside as well as the turn button from the inside. As the industry leader, Weiser has provided trusted security for over 100 years and has become synonymous with security, peace of mind, style and innovation. The clean lines of Kingsway handle set lend a casual yet stylish ambiance to your entry door and offers security with flair. The Alfini interior lever's graceful styling fits in a wide range of decors. The Satin Chrome finish gives the product a modern and minimalist look. This modern handle set is equipped with SmartKey<sup></sup> Technology - which allows you to control who has access to your home. Re-key the lock yourself in seconds in 3 easy steps - as often as you wish. SmartKey Technology provides the highest level of residential security and protects against lock bumping. At Weiser, we believe people shouldn't have to settle when it comes to home security. And the best security is smart security. Get Smart. Get Weiser. Step up to designer styles and superior security with Weiser's Welcome Home series of products. The curved and rectilinear lines of Hawthorne make a beautiful exterior complement to many design styles & the Toluca interior lever's fashionable wave silhouette design is the perfect complement to homes with inspired style. The Venetian Bronze finish is hand-rubbed to reveal unique bronze highlights and provides a rich and warm complement to the product's style. This modern handle set is equipped with SmartKey<sup></sup> Technology - which allows you to control who has access to your home. Re-key the lock yourself in seconds in 3 easy steps - as often as you wish. SmartKey Technology provides the highest level of residential security and protects against lock bumping. At Weiser, we believe people shouldn't have to settle when it comes to home security. And the best security is smart security. Get Smart. Get Weiser. Powerbolt 2.0 Venetian Bronze Keyless Entry Keypad Deadbolt Powerbolt innovated the keyless entry technology over 10 years ago and has stood up to the test of time. Simply enter your personalized access code for convenient keyless entry. Powerbolt is easy to install, program and use. And the motorized driven deadbolt allows for one-touch locking. It operates on 4 AA batteries and features SmartKey re-key technology as the back-up keyway. This single cylinder deadbolt can be locked or unlocked by using the keypad or key from the outside as well as the turn button from the inside. 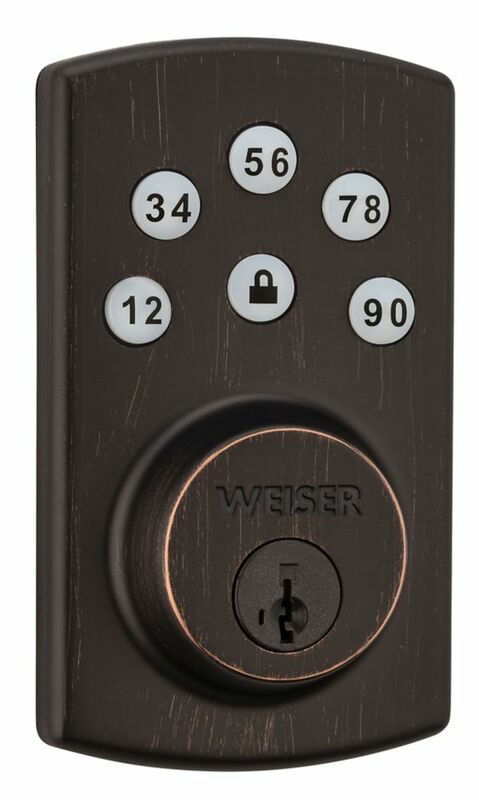 Powerbolt 2.0 Venetian Bronze Keyless Entry Keypad Deadbolt is rated 3.8 out of 5 by 5. Rated 4 out of 5 by CPD7 from 1/2 Worked Great Bought 2 of these for my new home. Both worked at the beginning, but after about a week 1 became very stiff and wouldn’t operate by the keypad. Second still works perfect. Rated 5 out of 5 by Terry from Great Product Installed about 6 weeks ago. Easy install, instructions were easy to follow. Works just like it is suppose to. Programming was simple and rekeyed to the door knob no problem which is one of the features. Waiting for it to go on sale again so I can purchase another one. Rated 1 out of 5 by Disappointed from Terrible Battery Life We bought this lock 2 years ago and on average get 30-45 per 4 AA Batteries using top brands and around 2 weeks when we once tried an off-brand battery line. I recommend you try a different manufacturer for your keyless deadbolt as the expense of batteries over time makes this lock no longer a good deal. Rated 5 out of 5 by Stefi15 from No key entry My kid doesn’t have to lose his key anymore! Love it! Rated 4 out of 5 by Mb29 from Good Product This deadbolt is very basic. It was easy to install but not very easy to program the lock codes even with the instructions. How long do the batteries last? Can rechargeable batteries be used? can the interior unit be installed upside down??? Weiser model # 9GED14600-102 is recommended for installation right side up for normal operation. Please contact or visit your local Home Depot special order counter for availability, pricing and shipping options. is it ok to use in harsh weather like Winnipeg? i want to use it for outside door. The interior side of the unit should not be exposed to rain; however, as it is intended to be on the inside of the door (inside the home). If the installation location allows the interior side to be shielded from the outdoors, like a home would, then it is OK. Installing the Powerbolt in a location that exposes the interior side to water is not recommended. does it have a Customized automatic door locking after 30 seconds ? The auto lock feature is not enabled by default. Once enabled, the lock will auto lock after 30 seconds.